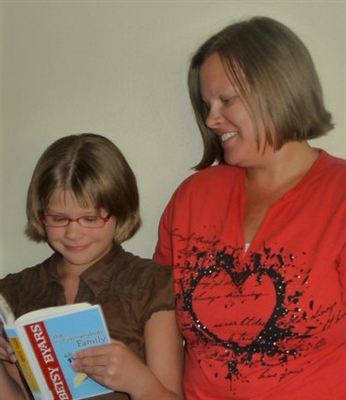 Aurora, OH, July 10, 2012 – Despite being told by five different eye doctors that her 8-year-old daughter Shelby’s vision was fine, Lynn DeVore of Yakima, Washington continued to search for reasons why her daughter continued to struggle with reading. The pediatrician said that since the eye doctors said Shelby’s vision was fine that Lynn “was just being paranoid and that maybe Shelby was simply not very smart.” She continued to search until she found the answer and now DeVore is stepping forward to help other parents by sharing their story for National Children’s Vision and Learning Month. “We knew there was a problem early on, but we were told she would read soon. We struggled and struggled and still reading was a fight. Shelby was very frustrated with reading and had very little confidence in all areas of her life,” shares DeVore. Fortunately she saw an ad in a local magazine that listed all the things Shelby struggled with. The ad was for a developmental optometrist who provides an in-office program of optometric vision therapy. How could so many eye doctors have missed this? A very good question! When parents suspect their children have a vision problem that is contributing to their learning difficulties they often go to the pediatrician or the pediatric ophthalmologist only to be told their child’s vision is fine and they can see 20/20. States Dr. David Damari, President of the College of Optometrists in Vision Development, “It is important for parents to know that when it comes to the diagnosis and treatment of vision problems which interfere with reading and learning, a comprehensive vision exam is needed. These children need to see an optometrist who provides an in-office program of vision therapy and performsthe in-depth testing required to determine if the child has all the visual skills required for academic success,”. Shelby was lucky that her mother didn’t take no for an answer. Take 5 minutes in honor of August being National Children’s Vision and Learning Month and visit the website for the College of Optometrists in Vision Development; then spread the word and share the information: www.covd.org. NOTE: Mrs. DeVore is available for interviews. In addition, other parents from across the U.S. are available to be interviewed.